Solar power can mean cleaner air, new jobs and even lower energy bills. But due to high up-front costs and other barriers, low- and moderate–income families and the organizations that serve them are a small fraction of Oregon solar customers. In February, Energy Trust sponsored four Solar for Oregon Communities workshops in Roseburg, Redmond, Hood River and Portland to gather input and ideas about ways to reach and serve more customers with solar. 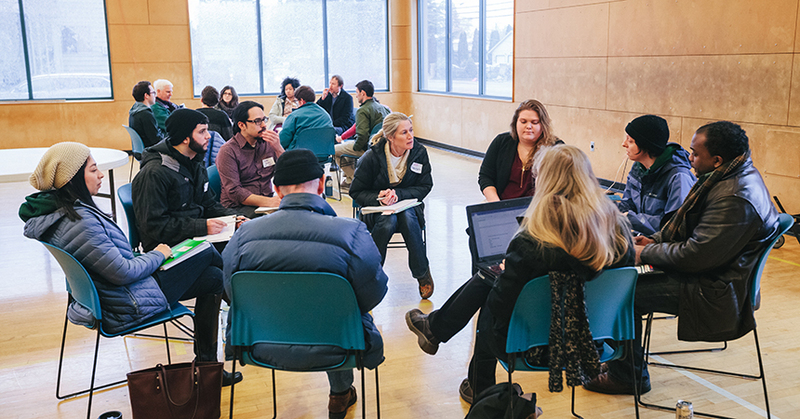 The workshops also received support from Oregon Department of Energy, Northwest Sustainable Energy for Economic Development (SEED), Sustainable Northwest and the U.S. Department of Energy SunShot Initiative. The workshops focused on how solar can reduce home energy costs and empower low-income residents to participate in renewable energy generation. With more than 120 members of the community in attendance, including residents, housing and community organizations, local governments and contractors, attendees learned how solar can benefit low- and moderate-income residents, share solar challenges unique to each community, brainstorm solutions and connect with other groups interested in collaborating on solar projects. Presenters summarized new state and federal programs to help finance low- and moderate-income communities to realize the benefits of solar through shared solar solutions. Shared or community solar programs aggregate customer demand to share the costs and spread the benefits across participants, reducing the financial and technical barriers of going solar. The U.S. Department of Energy’s Solar in Your Community Challenge is currently offering a $5 million contest to support community-based solar programs across the county. In Oregon, the Oregon Public Utility Commission’s community solar program is being designed to make it easier for renters, low-income households and others to participate in solar. How can you get involved in community solar in Oregon? To learn more about Oregon Public Utility Commission’s community solar program rulemaking process and how to engage, contact Michael Breish. If you live or work in Eastern or Southern Oregon, contact Lee Rahr at Sustainable Northwest about clean energy solutions in your community. If you would like to stay informed about ongoing solar incentive legislation and policy for community solar in the northwest, contact Jaimes Valdez at Northwest SEED.